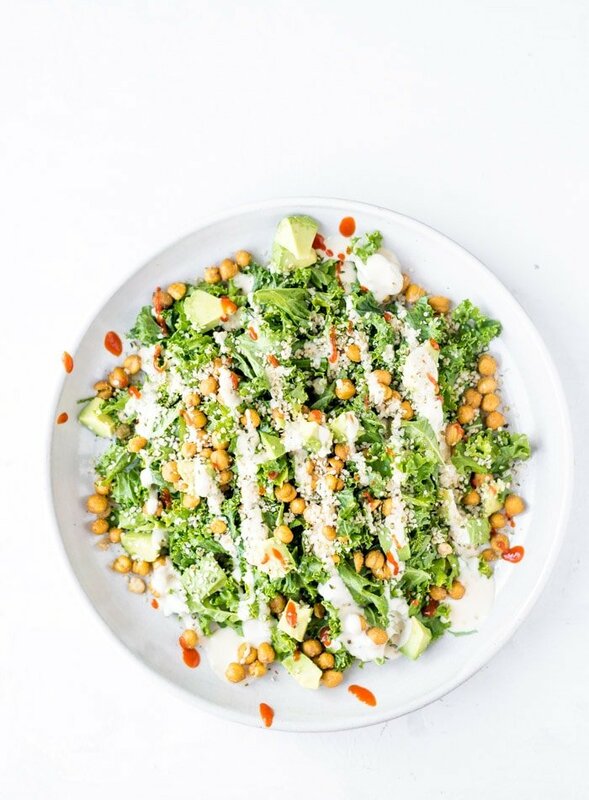 This roasted chickpea avocado salad might just be your new favourite meal. 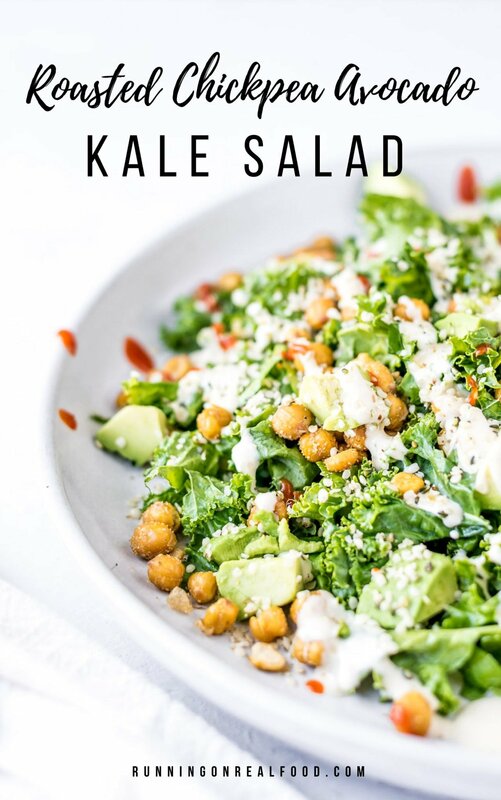 It’s made with a base of kale, a creamy tahini lime dressing, crispy roasted chickpeas, hemp seeds and avocado for a simple but flavourful and filling dish. This hearty, nutritious salad can be enjoyed as a main dish or a side to your favourite soup or sandwich. Vegan salads don’t have to be boring bowls of lettuce. There are plenty of ways to dress them up to create filling, balanced meals. Think about adding a source of fat and protein along with your veggies to create more substantial salads as main dishes. 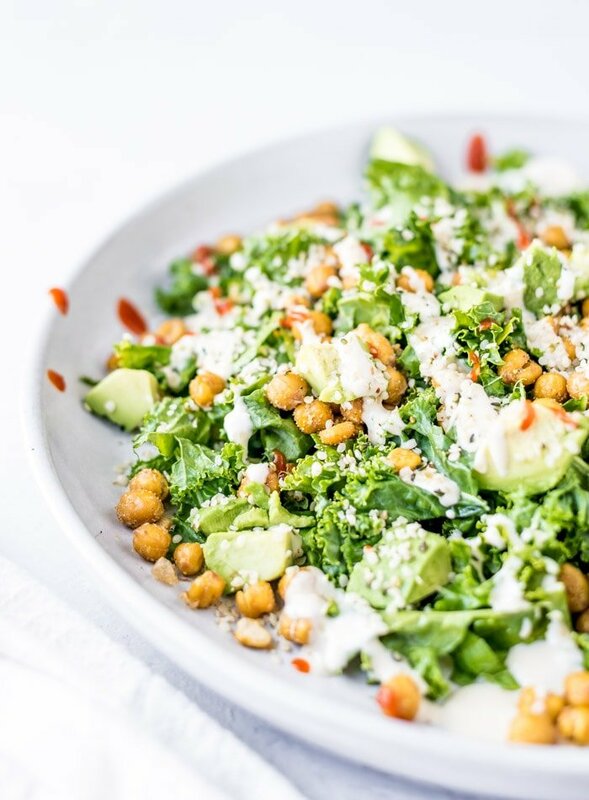 This kale salad has plenty of healthy fats from the tahini, avocado and hemp seeds and the chickpeas and hemp seeds bring some protein to the mix. It’s also rich in dietary fibre, helping to keep you full for hours. There are a lot of different methods and techniques online for making crispy roasted chickpeas. The two steps that I’ve found to be important are thoroughly rinsing and drying the chickpeas and not adding any seasoning until after they’re roasted. Starting with a dry chickpea seems to help the most. I don’t peel them but some of the peels will come off as you roll them around in a dish towel. For best results you can peel them all but I don’t really find it to be necessary and I’m also far too lazy to remove all the skins. You can make roasted chickpeas with or without oil but I usually use a couple teaspoons of olive oil or avocado oil. You don’t need much. So drain, rinse well, dry well, toss with oil, spread on a baking tray, bake them at 350 F for 45 minutes…that’s it! Well after they’re baked, toss with desired spices or other seasonings and allow to cool before storing. For this recipe I used cumin, coriander, sea salt and pepper. 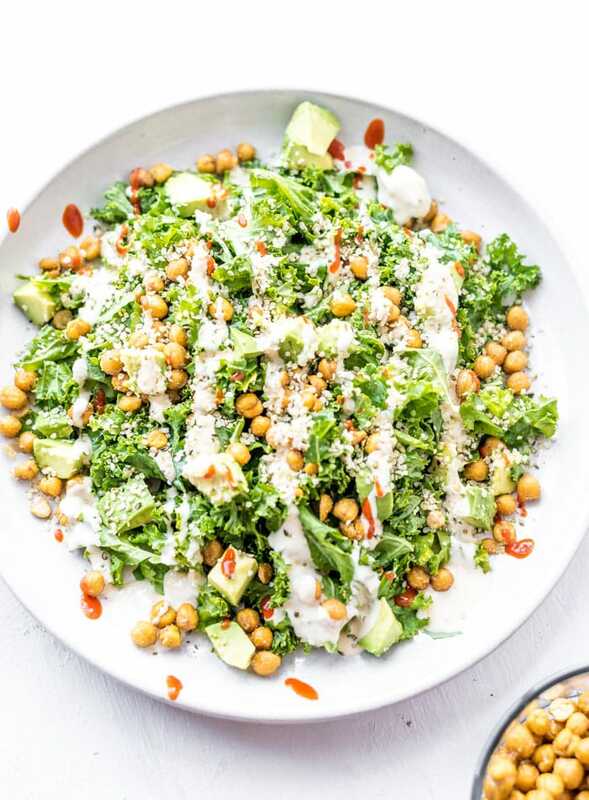 Tahini dressing is my go-to salad dressing and it’s perfect on this chickpea avocado salad combo. There are endless ways you can make it but my must-haves are tahini, garlic, lemon, sea salt and water. From there you can mix in a bit of maple syrup for a sweeter dressing, apple cider vinegar for more tanginess, herbs such as dill, cilantro or basil and different spices such as curry powder, turmeric, cumin or paprika. For this recipe I used lime instead of lemon and otherwise kept it simple with just garlic, lemon and maple syrup. This salad has a lot going on health-wise. Let’s see what it’s bringing to the table. Tahini tastes amazing and is one of my favourite foods but what I really love about it is it’s iron and calcium content, making it a wonderful food for plant-based eaters. It’s also a good source of vitamin E, potassium and magnesium and has a higher protein content than most nuts. Tahini is great spread on toast, with oatmeal, in smoothies, in energy bars and as in this salad, used in delicious, creamy salad dressings. Kale is a good source of disease-fighting antioxidants, vitmain K, vitamin C, vitamin A, mangases, copper, B6, fibre, calcium, potatssium, vitamin E, iron…I could go on, there’s more. Kale is good stuff. As far as whole foods go, dark leafy greens like kale are the most nutrition per calorie than any other food. According to How Not to Die, eating greens nearly everyday may be one of the most powerful stems you can take to prolong your life. In addition, a team of Harvard University researches analyzed all food groups and found that greens turned out to be associated with the strongest protection against major chronic illnesses including up to a 20% reducing in heart attack and stroke for every daily additional serving. So eat those kale salads, drink those kale smoothies and add greens to your soups, stews and sandwiches. The oils found in avocado include oleic acid and linoleic acid which may help lower cholesterol levels and even increase healthy HDL cholesterol. Avocados contain lutein and zeaxanthin, two phytochemicals that are especially concentrated in the tissues in the eyes where they provide antioxidant protection to help minimize damage and prevent age-related macular degeneration. Half an avocado provides 25% of your daily vitamin K, an essential nutrient for bone health and the prevention of osteoporosis and arthritis. Despite that perfect creaminess, avocados are actually quite high in fibre, making them great for digestion and gut health and managing blood sugar levels and hunger. Half an an avocado provides about 20% of your daily folate, which is important for healthy pregnancies and may lower the risk of depression. Chickpeas, or garbanzo beans, are an excellent source of fibre, folic acid and manganese and contain iron, magnesium, folic acid, copper and zinc. Eating a diet rich in fibre can help lower cholesterol and improve blood sugar levels. Hemp seeds are my go-to source of omega-3 EFA’s and are also a good source of vitamin E and iron. Omega-3’s are hugely important for our overall health. 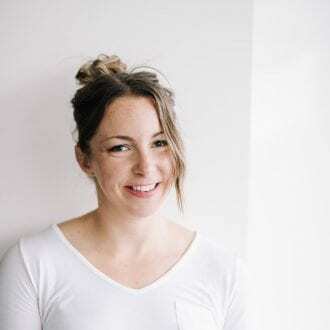 They support brain health, prevent cardiovascular disease, nourish the brain and nervous tissue, reduce symptoms of anxiety, depression, joint pain and have overall powerful anti-inflammatory properties. The issue is when we eat too many omega-6’s and not enough omega-3, omega-3s can’t do their job. Omega-3 deficiency can lead to asthma, diabetes, arthritis, hormone imbalances, cancer and skin conditions so it’s really important you make them a priority in your diet. Chopped and massaged kale. I’d recommend massaging your kale with a tiny bit of olive oil to soften it up and improve digestibility. Hemp seeds. Hemp seeds are rich in zinc, vitamin E, iron and essential fatty acids. They really are a superfood and are such an easy to incorporate many essential nutrients if you eat a plant-based diet. Ripe avocado. You can’t beat avocado for adding rich, creamy texture to salads. Use an avocado that’s ripe enough to eat but not so ripe that it turns to mush when you dice it. A slight give when squeezed should be just right. Roasted chickpeas. Roasted chickpeas add a nice crunch to salad, almost like a crouton. I roasted them in cumin, coriander, salt and pepper for flavour. Tahini lime dressing. While I pretty much always go tahini lemon, today we’re going tahini lime. Not into lime? No worries…lemon is just as delicious. Whisk this dressing together in a small dish, no blending needed. Looking or more kale salads? Try my Roasted Potato Kale Salad with Balsamic Vinaigrette, Roasted Chickpea Kale Salad, Vegan Kale Caesar Salad with Roasted Chickpeas or Buffalo Cauliflower Kale Salad. 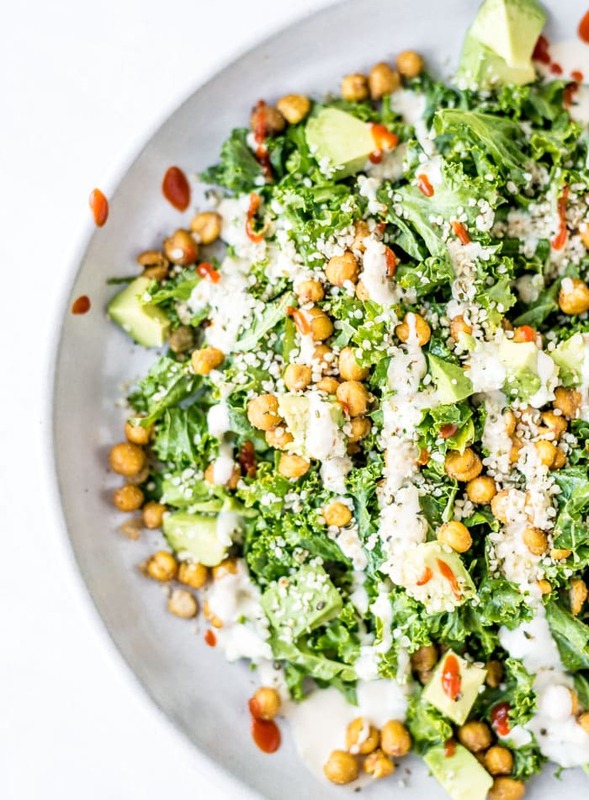 One serving of this salad including the tahini dressing contains 535 calories with 50 grams of carbohydrates, 23 grams of plant-based protein and 30 grams of healthy fats. You’ll also be getting a a whopping 19 grams of dietary fibre! It’s also rich in calcium, iron, vitamin A, vitamin C, magnesium, manganese, potassium, folate and a range of other essential vitamins and minerals. This salad is filling, nourishing, full of flavour and easy to make. 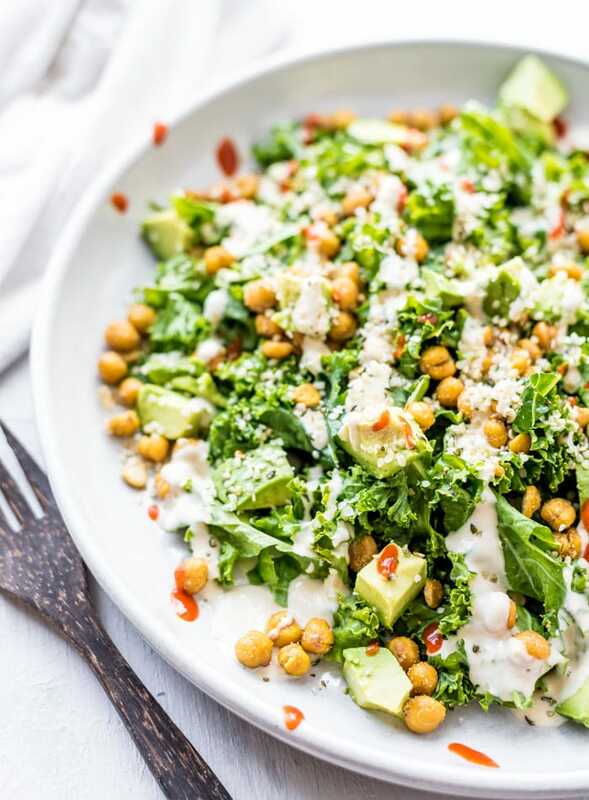 The roasted chickpeas provide the perfect crunch against the creamy avocado and the tahini lime dressing adds so much flavour, you might just wanna lick the bowl. Prepare the chickpeas by draining them and giving them a thorough rinse. Place them on a dish towel, fold it over them and roll them around until they’re near completely dry. The drier, the better. If some of the skins come off that’s good, you can pick those out. For the crispiest chickpeas, remove all the skins. 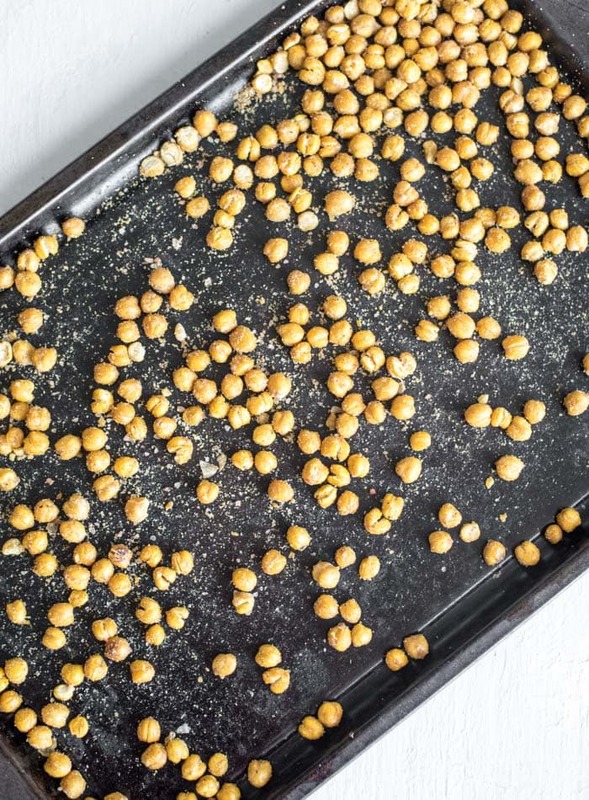 Place the dried chickpeas on a baking tray and drizzle them with the olive oil, rolling around so they’re all coated. Roast for 30-40 minutes until golden brown. When they come out of the oven add the spices and roll around to coat. They will get crispy as they cool. To make the dressing, add all the ingredients to a small dish and whisk until smooth and creamy. To prepare the salad, add the kale to a bowl and massage with the olive oil. Top with the diced avocado, hemp seeds, roasted chickpeas and a drizzle of the tahini dressing. The dressing and roasted chickpeas make enough for 4 salads. Adjust the salad ingredients accordingly or use the extra dressing and chickpeas for other salads and snacking. Inspired by this recipe from Feed Your Glow. It’s a good one!! Hope you like it! Making this right now for our dinner this evening as a side with a sweet potato lentil shepherds pie. Wonderful! Let me know how it goes! Thank you! That means so much because I love your photos! 🙂 This is basically all of my fave foods.